Two tenets of collecting that seem axiomatic are that it’s always wise to invest in that which is timeless and that men of all ages will collect baseball cards. That second notion was challenged a few decades ago when two natural enemies whipsawed the category. 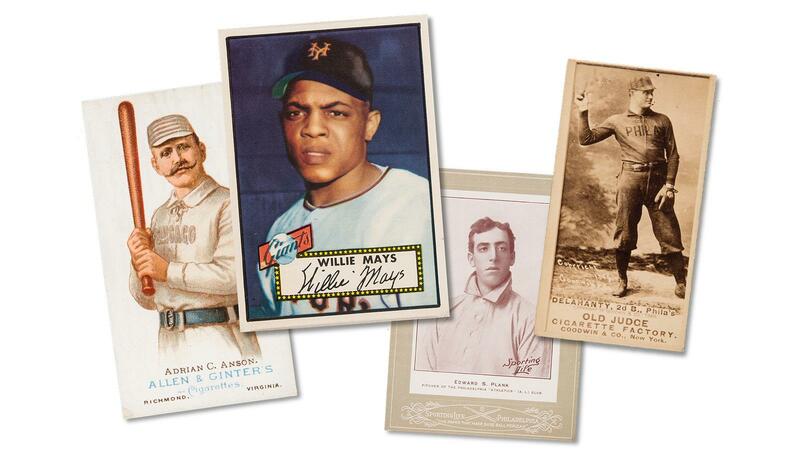 Cards—and, later, autographed pictures and balls—were all the rage for collectors, when so many companies were producing cards that the market was oversaturated. Supply outstripped demand and the cards’ value plummeted. And for autographs the buzz became the “F” word: fraud. It emerged on a grand scale, as the FBI estimated that 90 percent of the autograph market in the 1990s was bogus. We adored those looping “Ms” in Mickey Mantle’s signature, but they were easy for an imitator to copy. Indeed, a Heritage online auction last May featured Hall of Famers Cap Anson, Timothy Keefe, and Ed Delahanty in 1887 baseball cards. Later cards, from 1902 through 1911, included Napoleon Lajoie, Eddie Plank and Honus Wagner. The prices ranged “affordably” from $400 to $27,000. But as excellent as such items are, they are nowhere near the high end. “Of baseball [collectibles], the Yankees have a good portion of that—the most dominant team, the most collected team and with the richest history,” Ivy says. The prices prove it. Of the 10 most expensive items belonging to individual baseball players sold at auction from 2010 through 2016, eight of those belonged to the Yankees. They included a 1952 Topps Mickey Mantle card in mint condition which fetched a staggering $1,135,250 in November 2016. A 1927 home jersey worn by Lou Gehrig went for $717,000. And the bat that Babe Ruth used to hit his then-record 59th homer in 1921 sold for $717,000, the same price as his 1916 card, when he was pitching for the rival Boston Red Sox. The Yankees aside, vintage items abound elsewhere. The boxing gloves used in the 1965 “phantom punch” bout between Muhammad Ali and Sonny Liston sold for $956,000 in 2015. A year later, Honus Wagner’s T-206 card made $776,750. As with immortal players, the finest collectibles stand the test of time. The history of the green jacket, the most coveted piece of apparel in the sports world. Spring is here, and that means it’s time for a tradition unlike any other—betting your hard-earned money on The Masters. The 2019 Els For Autism charity golf tournament raised more than $1 million.